This guide will show you how to assign the "Admin of Server Admins" permission. 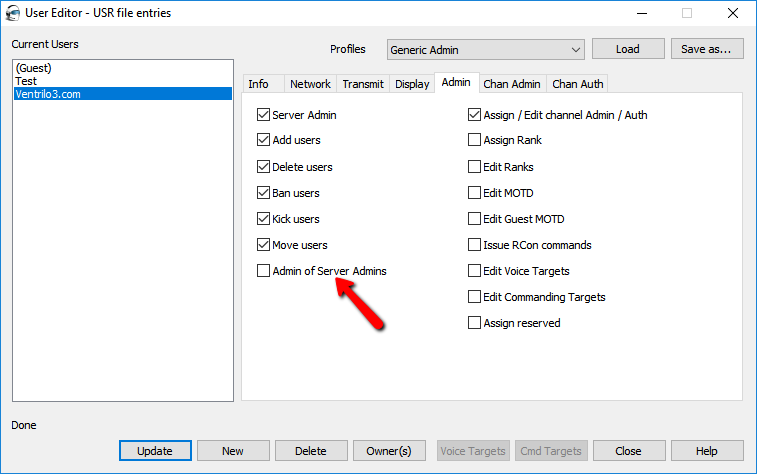 Admin of Server Admins is a new permission that grants users the highest level of Permissions on Ventrilo. It allows for full control over the entire server along with deleting other Server Admins. We recommend that you use this option very carefully, as it does allow full access to all settings on your server. In order to assign the permission "Admin of Server Admins", the user would need a User Account in the User Editor. You can follow this guide to create new User Accounts. The Admin of Server Admins permission can be found and assigned under the "Admin" Tab in the User Editor. Select a User and Checkmark that Permission and click on "Update".